What a relaxing weekend it has been for me so far. 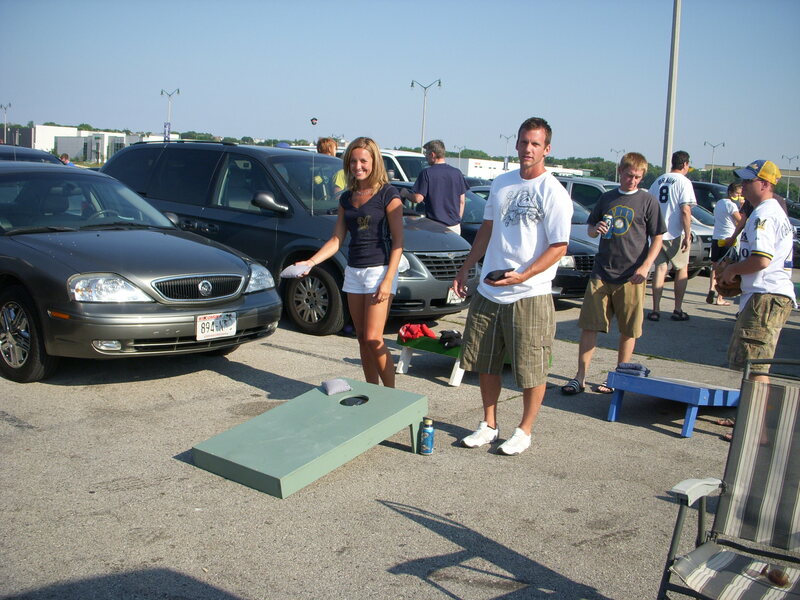 Any weekend that involves sunshine, friends and great food is always a good one in my book. After a last minute decision to head to visit my friend Katie, I hopped in the car. I was excited to try out a new cafe for lunch and stop at some new-to-me health food stores. 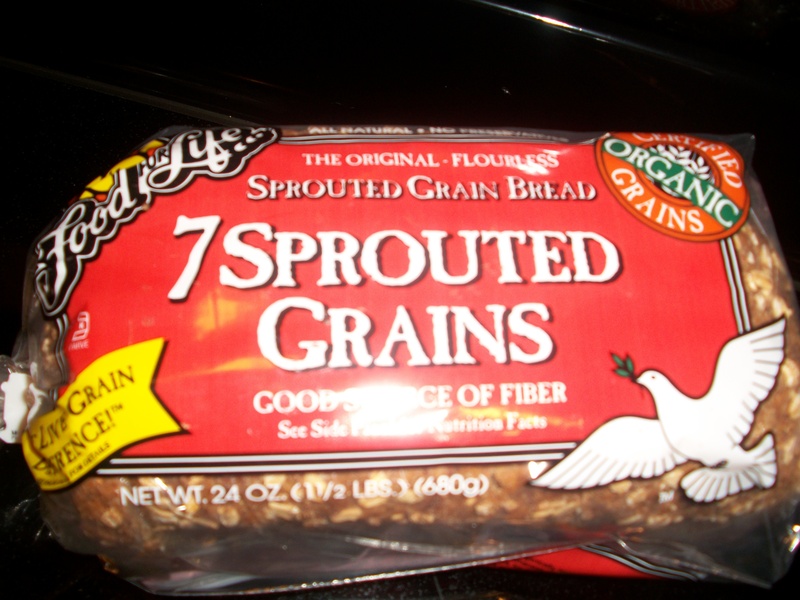 We visited The Main Grain Bakery where I picked up a fresh loaf of their seed bread. It was nutty and delicious. We then made our way to a country store with tons of bakery items, nuts and seeds in bulk. 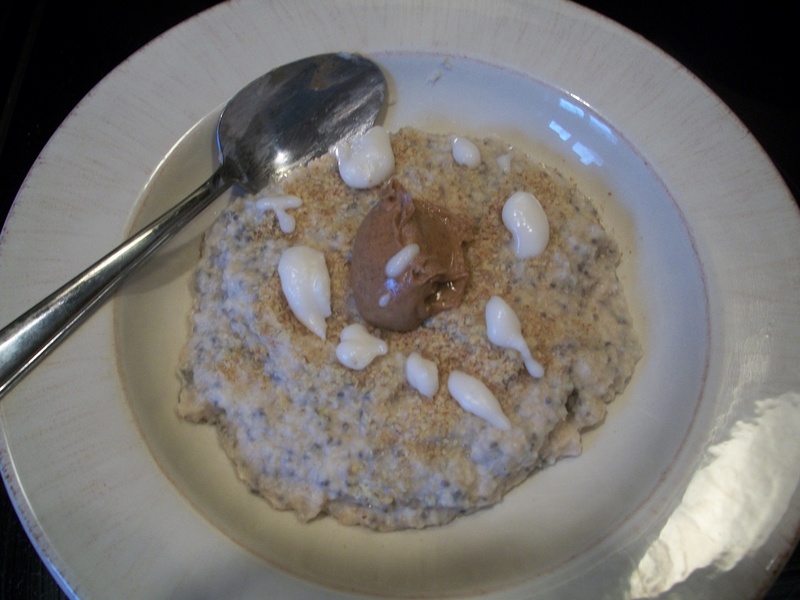 Oat bran, chia seeds, sunflower seeds and coconut. Yesterday my mom had to work, and she ended up getting home super late. I knew she was going to be starving, so I threw together a flatbread pizza similar to my margerita pizza from several days ago with the one flatbread remaining. I decided to do something a little different than the other day since we didn’t have any basil left. 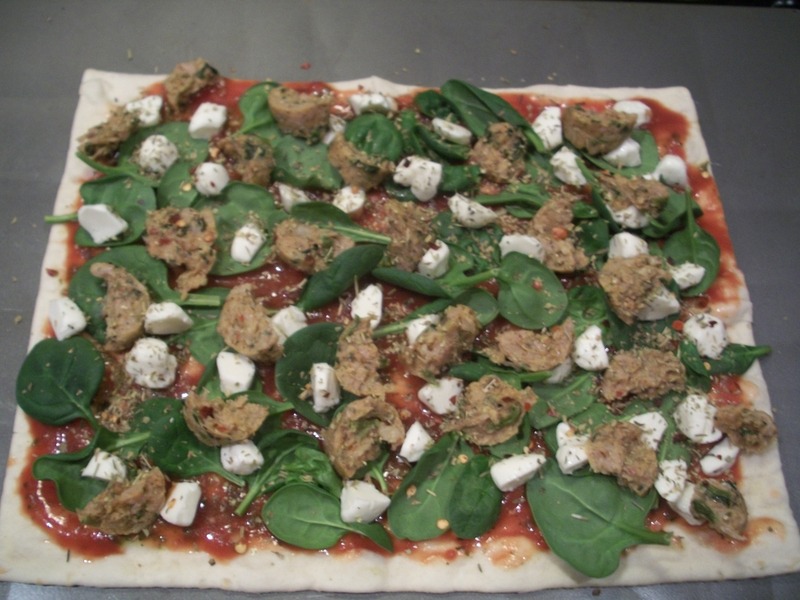 1 chicken sausage (flavor of your choice) I used spinach and feta. Shredded parmesan cheese (sprinkled)-The pictures don’t show the parmesan, as it was a last minute addition. 2.) 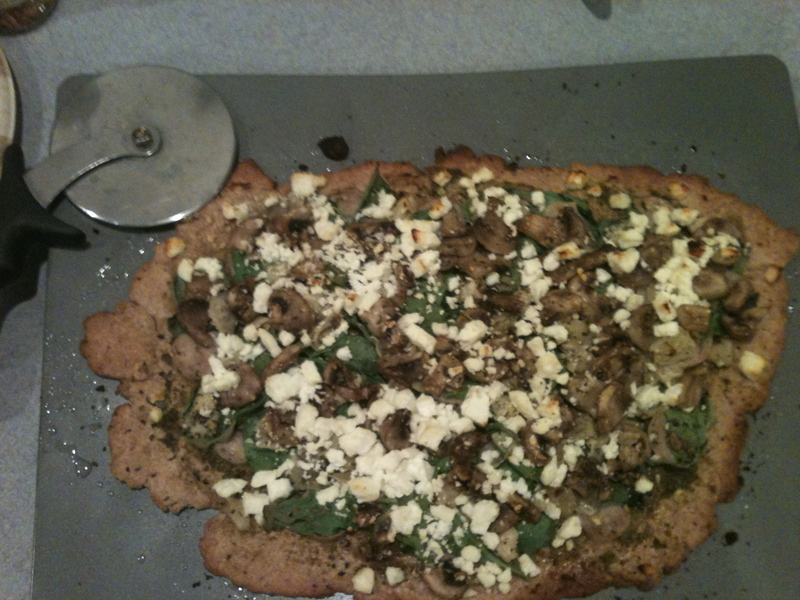 Place flatbread on a cookie sheet and spread pesto sauce evenly. Then top with tomato sauce. 3.) 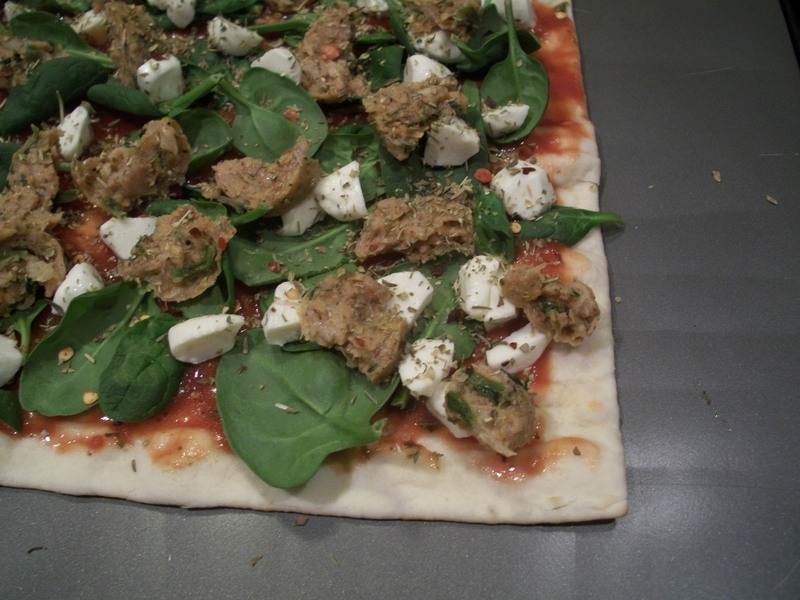 Place a thin layer of spinach across the entire pizza. 4.) Add fresh mozzarella, shredded parmesan and chopped chicken sausage. 5.) Top with italian seasoning. 6.) Bake for 10-12 minutes, and broil on low for the last 3 minutes, or until crispy on the edges. There are so many different pizza combinations, and I can’t wait to keep exploring the possibilities!! 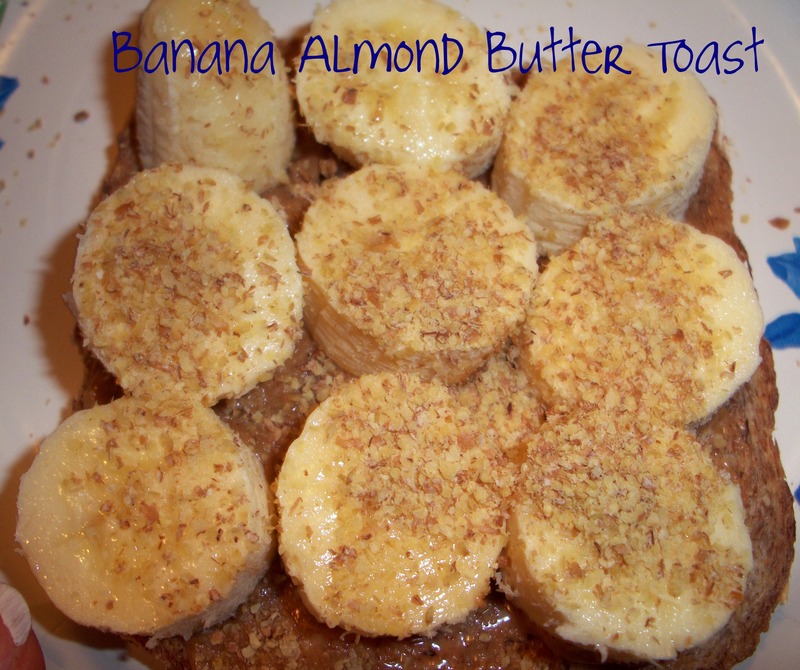 This morning started out with a new concoction that my friend Katie suggested to me she tried out the recipe from the Heather Eats Almond Butter blog. I made something similar with an added twist. Using my new oat bran, I cooked a 1/2 cup of oat bran with 1 cup of water on the stove in a sauce pan. This took about 3-5 minutes until all of the water was absorbed. 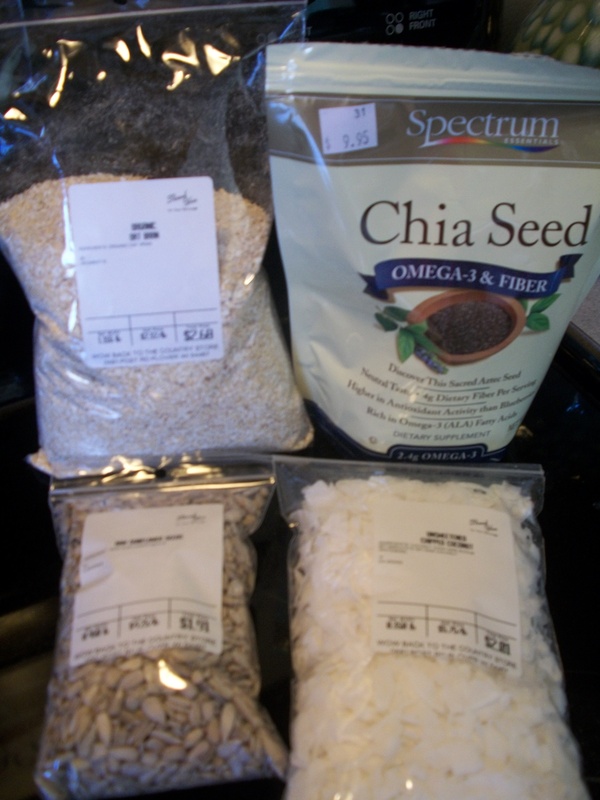 Then I stirred in approximately 1 Tablespoon of chia seeds and poured it into a bowl. Now I’m trying to find the motivation for a nice afternoon walk before it’s time to work on dinner. I’m hoping for another cookout with my mom and grandpa and currently have a pork loin marinating in the fridge. I’ll be back with an update and pictures of the finished product. Enjoy the rest of your Sunday! I did it again!!! I went for another 4 mile walk tonight after school, but this time I went alone. For some, this may not seem like a big accomplishment, and for others, it would be a great goal. For me, it’s something I feel really good about doing. It lasted about an hour, and for the most part, I felt really relaxed and happy with myself and my body. My legs were itching for most of the walk though, and I’m thinking it’s because of allergies and all of the stuff flying in the air. On Monday my throat hurt, and my eyes have been puffy all week. Allergies seem to make the most sense. In other news, tomorrow marks the end of three weeks of student teaching, and I honestly can’t believe it! Unfortunately I still don’t feel like I’ve done much of anything and don’t feel like I’ve gotten to know the students all that well either. I’ve been questioning my future a lot lately, and it’s something that I think about on a daily basis. Although I will be a licensed teacher, I don’t always know if a junior high or high school setting is right for me. I could go on and on, but right now things are out of my control. Korey and I are constantly trying to imagine what our future holds…where we will be, where we will work, etc… All that is certain at this point is that we’ll be together, and that is what’s most important. It’s so nice knowing I’ll always have him to be there for me when times are tough and things are unknown. Okay, sorry for the serious conversation, but it’s a necessary evil and something that is constantly weighing on my mind. 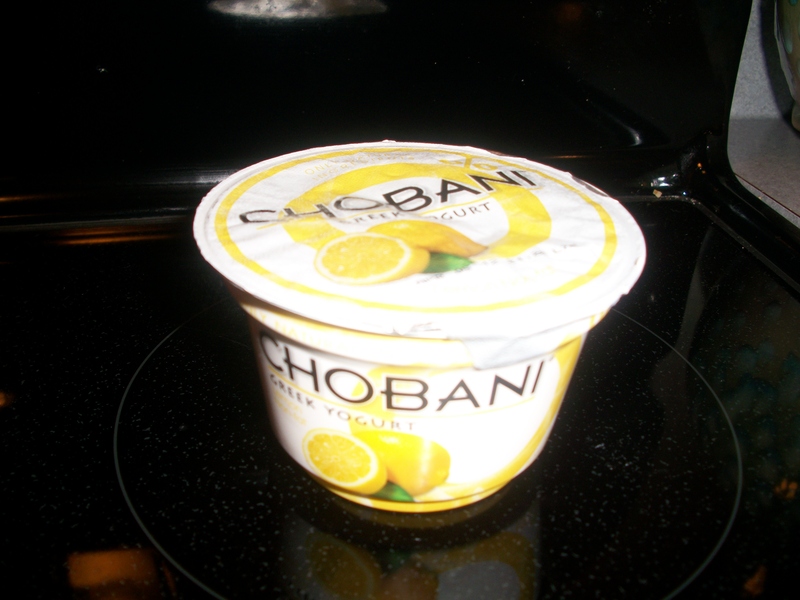 Speaking of things that are constantly on my mind… let’s talk about food! Unfortunately there are days when I just can’t get food out of my brain. I’m constantly living for the next meal, and it really needs to stop! Ever since my mom’s Bunco party the other night, I have been craving the mediterranean hummus dip that I created. Since I’ve been obsessed with hummus lately, and after being inspired by other bloggers, I decided to try using hummus as my salad dressing today. Trust me, I wasn’t disappointed. There are so many varieties of hummus that are packed with flavor, and I feel like it’s so much healthier than actual dressing too. 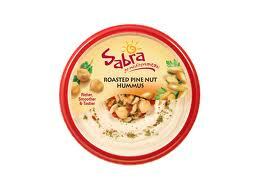 I chose to use the Sabra Roasted Pine Nut Hummus, which is my absolute favorite. My salad a mix of spinach and romaine topped with sunflower seeds, hard boiled eggs and almonds. Sorry I forgot to snap a picture. I’m not used to being a new food blogger and having my camera with me at all times. 🙂 Bare with me! Other than that, my day was the same as usual. As always, I’m looking forward to Friday because it means out to dinner with the family. I used to go out to eat a ton more, but now that I’ve got my mom on the healthy living kick, we try to cook as many meals at home as possible. Well, the allergies are starting to kick in again, and I’m thoroughly exhausted. It’s time to kick back and relax… and maybe munch on some snacky food. Well we’ve made it over the hump… I’m so glad to say that it’s almost Thursday. Luckily this week has gone pretty fast, and lets hope it keeps up! After school today, my mom and I headed out for a nice, long 4 mile walk. We chose to take the same route Korey and I took on Sunday. It was the perfect walking weather with a nice breeze. After a frustrating day, the walk was essential in order to get rid of my frustration! When we arrived home, our legs were feeling tired, but our stomachs were also grumbling! As badly as we wanted to sit down and rest, we knew we needed to throw together some dinner. Lucky for me, my mom took more initiative and put together a chicken and veggie salad that definitely hit the spot. 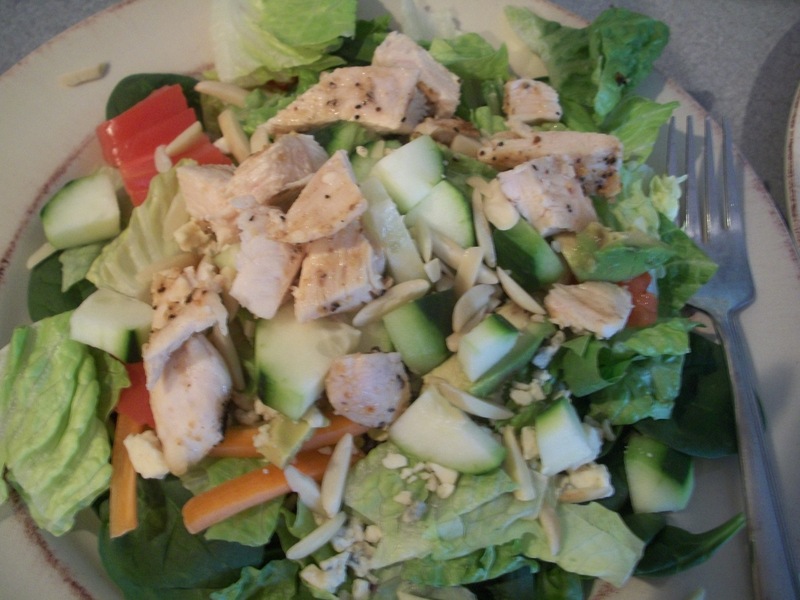 This salad had grilled lemon pepper chicken, carrots, tomatoes, cucumbers, slivered almonds, and avocado. I topped mine with a raspberry walnut dressing. Half way through our taxes we had an unexpected surprise. 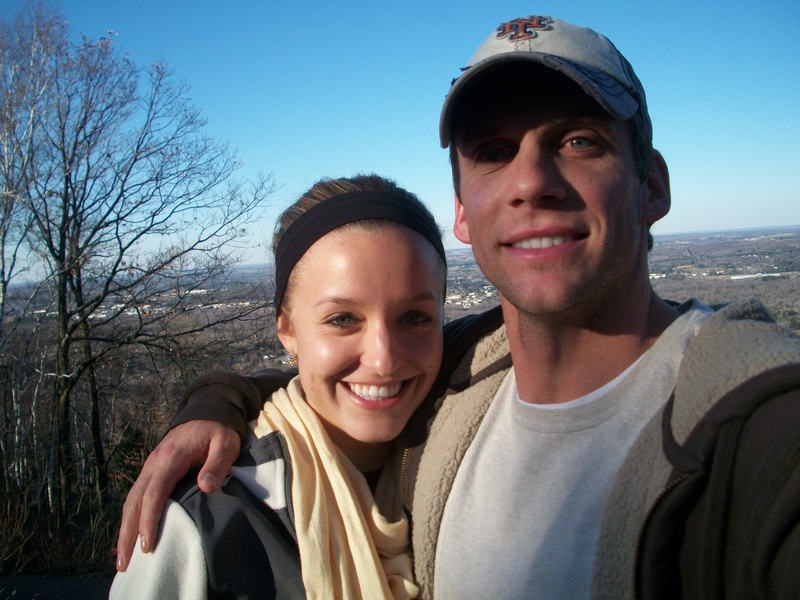 My brother’s girlfriend, Mandy, is home for spring break this week, so she stopped over to visit. That is a waaaaay old picture, but a cute one none-the-less. I’m so glad we got to catch up! Before I let you go, (and let myself go and get some much needed sleep! 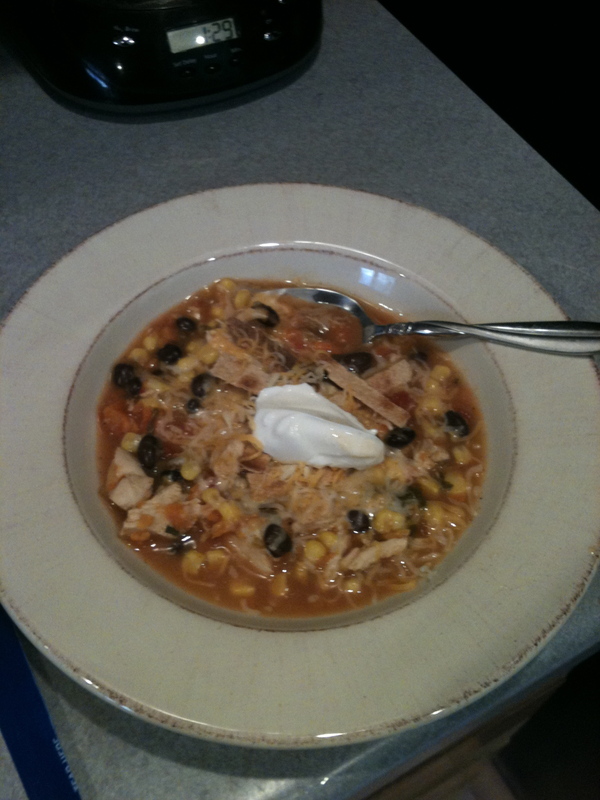 ), I have one more new recipe for you that I created for last night’s Bunco party. **Ingredient amounts are approximate. Feel free to add more or less as you wish! 2.) 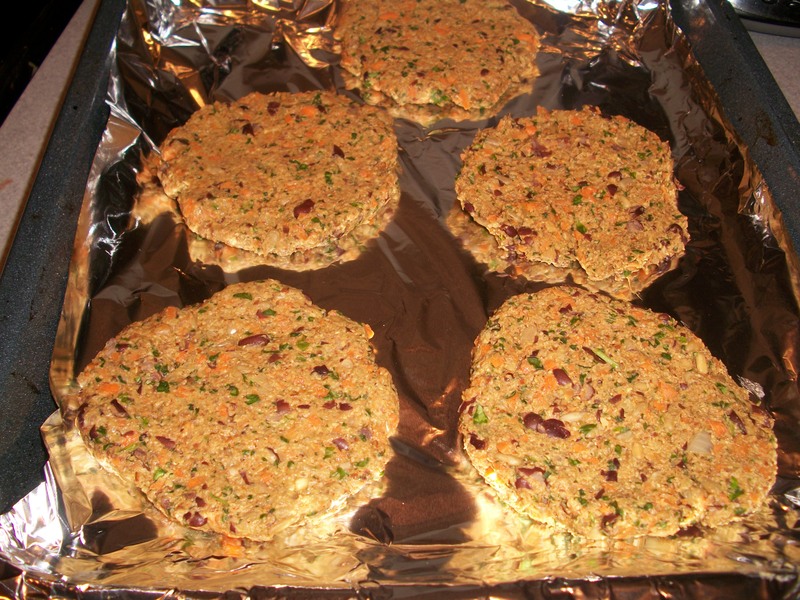 Lay flatbread on a baking sheet, and spread a thin layer of sauce. 3.) 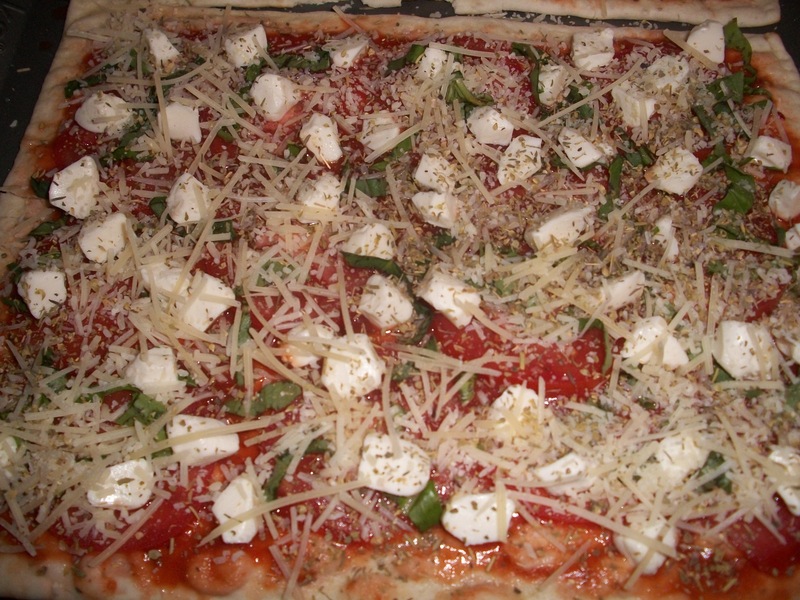 Add tomato slices, shredded basil, cheeses and seasoning evenly to the sauce. 4.) Bake for 10-15 minutes, and broil in order to crisp the edges and the top. 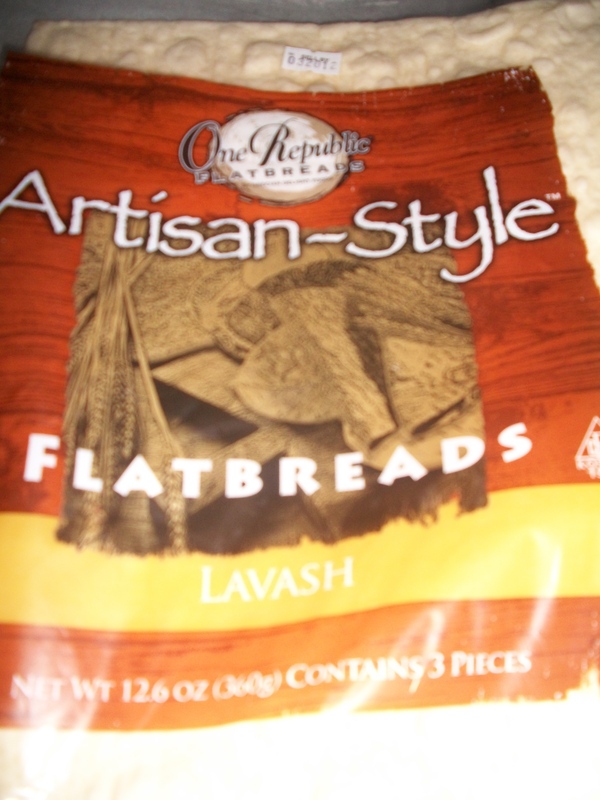 I chose to use the One-Republic brand, however any thin flatbread would work. 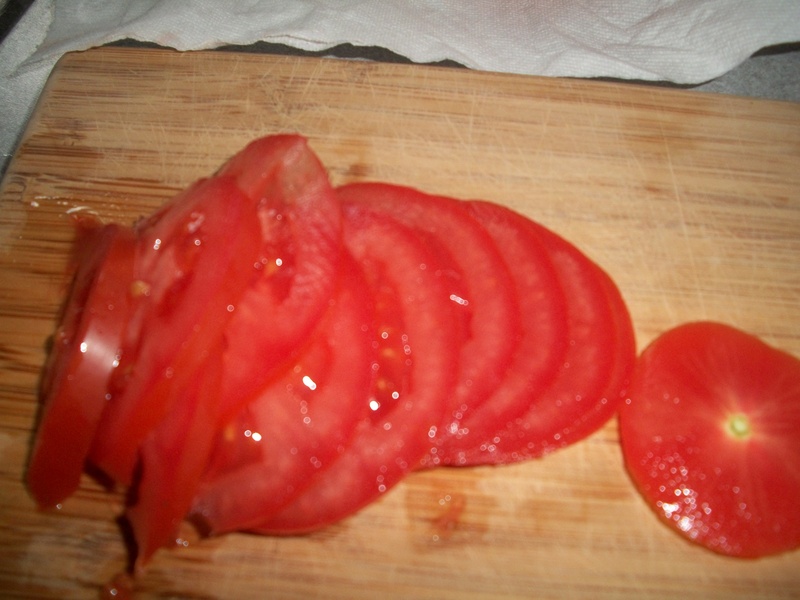 Thinly sliced tomatoes are key! 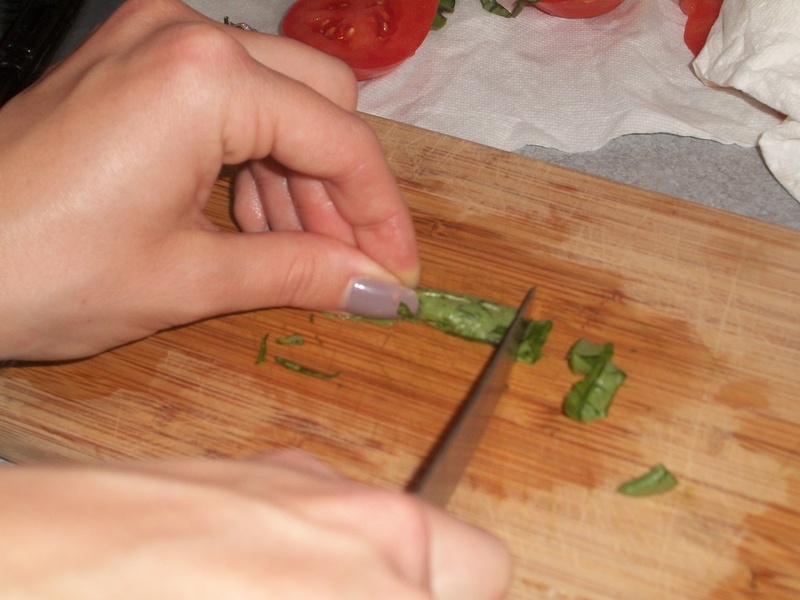 The next few pictures describe the way that I chop the basil. It creates thin ribbons of basil that are great for sprinkling! Take several basil leaves and fold them in half. 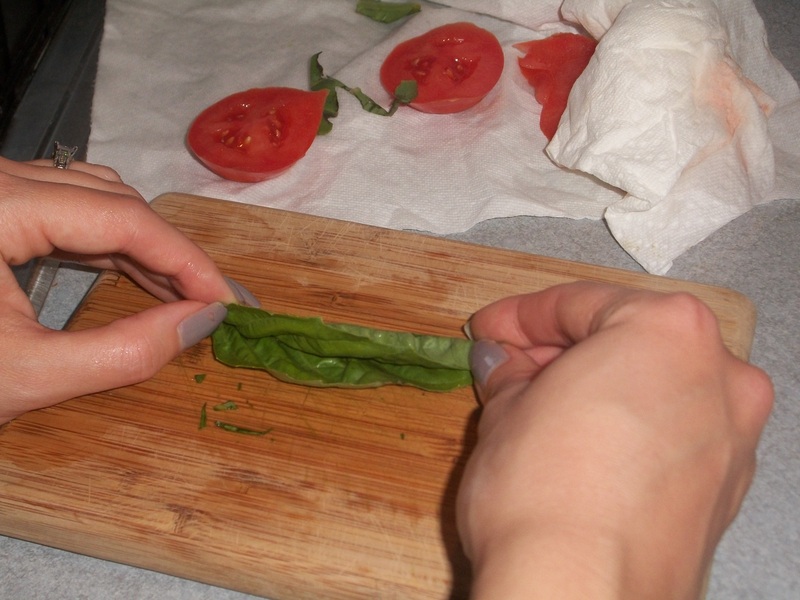 Roll the basil leaves tightly into a tube shape. 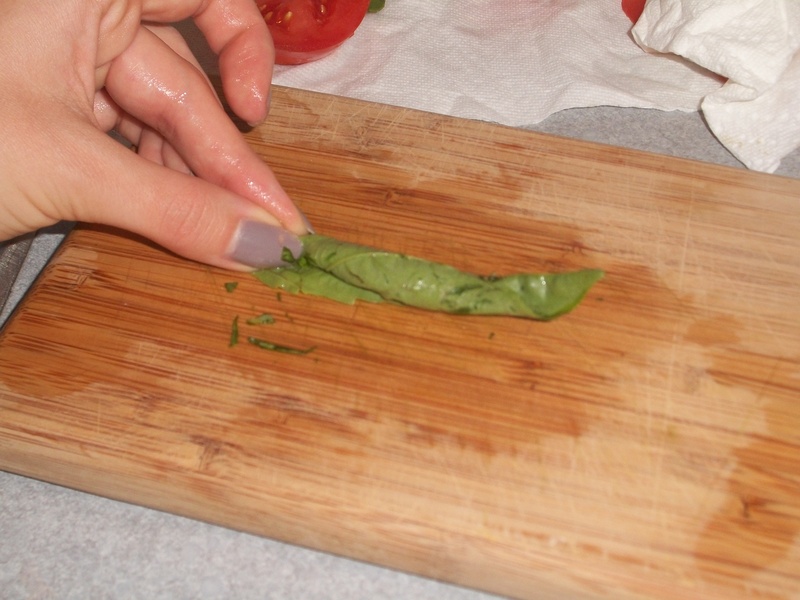 With a knife, slice off small pieces of basil. 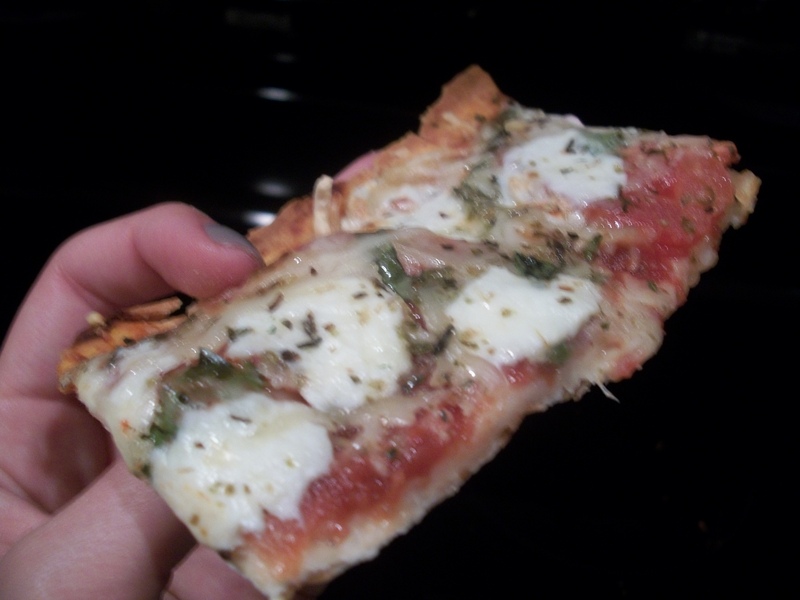 Fresh basil is one of my favorite fresh herbs, and a necessary ingredient for a margarita pizza. Flatbread with all of the toppings. 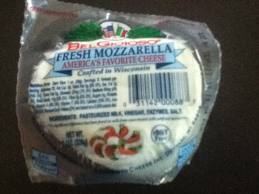 In case you’re not familiar with fresh mozzarella, here are a few images of different varieties below. 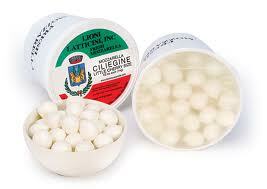 The fresh mozzarella comes in either a large ball or small pearls. Either variety works, though. I used the pearls for my recipe and chopped them in half. However, it may be easier to use thin slices from the large ball. 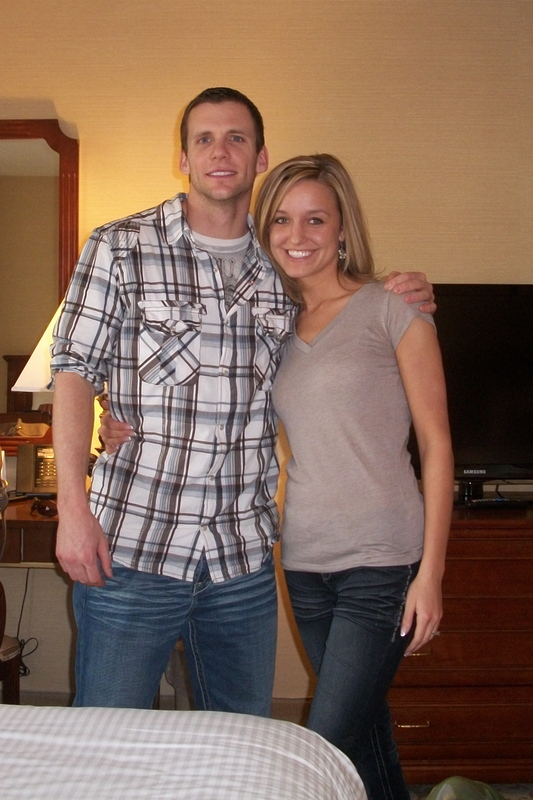 March 19th, 2012…one year ago today I was out on my first date with the most wonderful person I’ve ever met. Any guesses?! 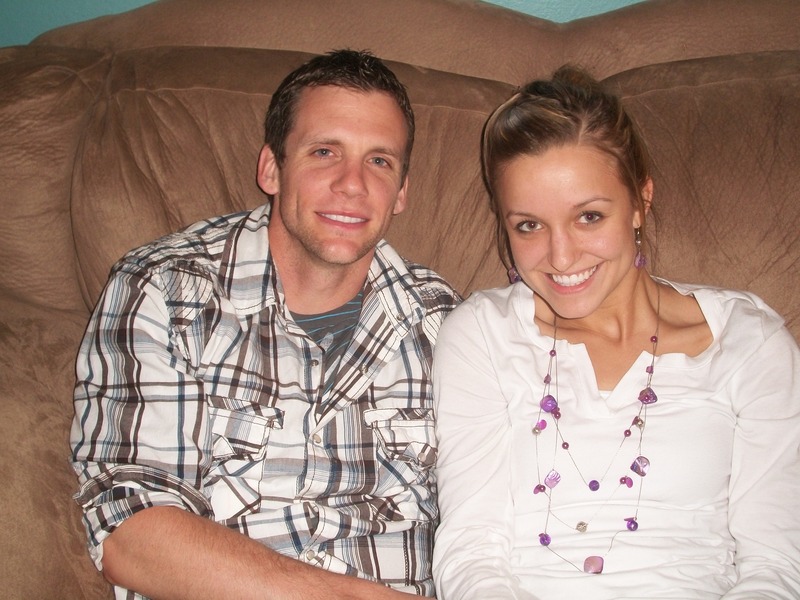 Yep, you guessed it… today is my one year anniversary with Korey. Boy, it has been one of the greatest years of my life. We have been through so many fun and exciting things over the past year, so I thought I would dedicate this post to our relationship. There are several things that have played a big role in our relationship, and I feel like they’re worth mentioning. 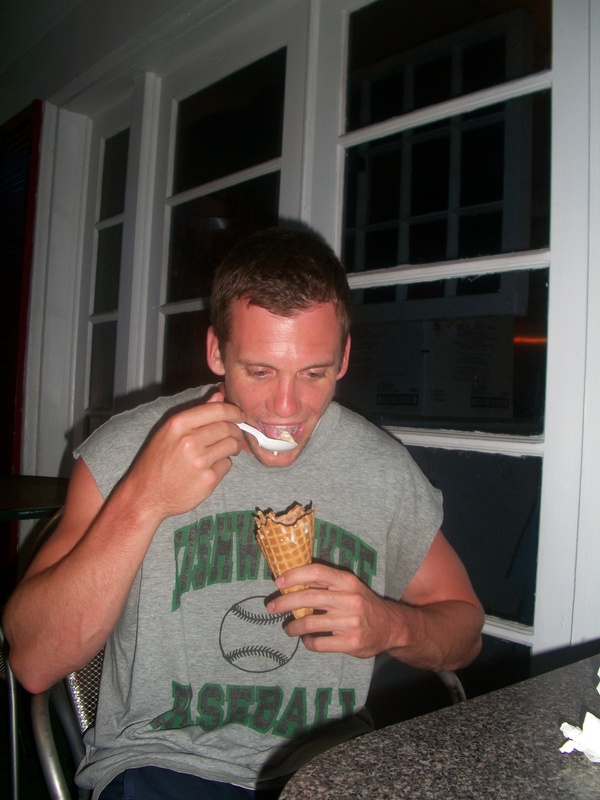 While being single, Korey has gotten the opportunity to travel to many places. I had only gone a few places before I met Korey, so it’s been amazing to see more of the world together. 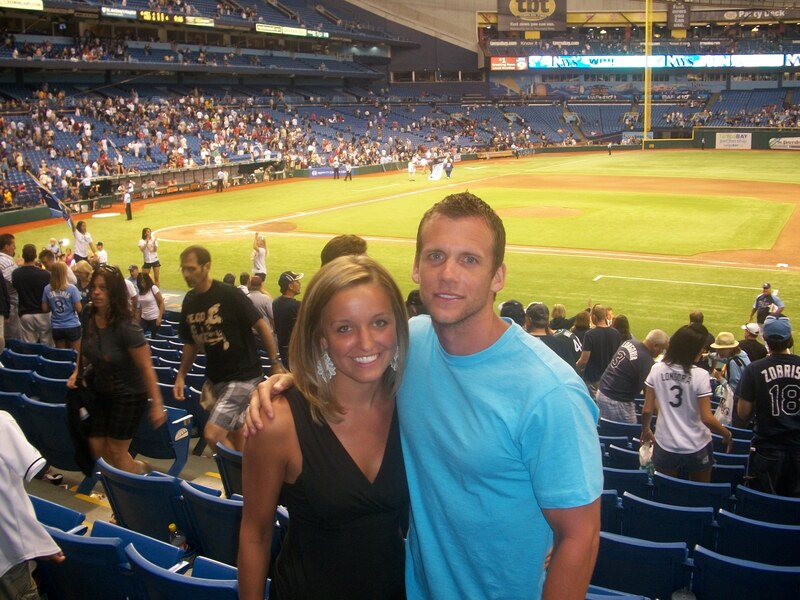 Our first trip together back in May was to Florida as a celebration of my graduation. Korey was lucky enough to be the first one to get me to do something daring!! 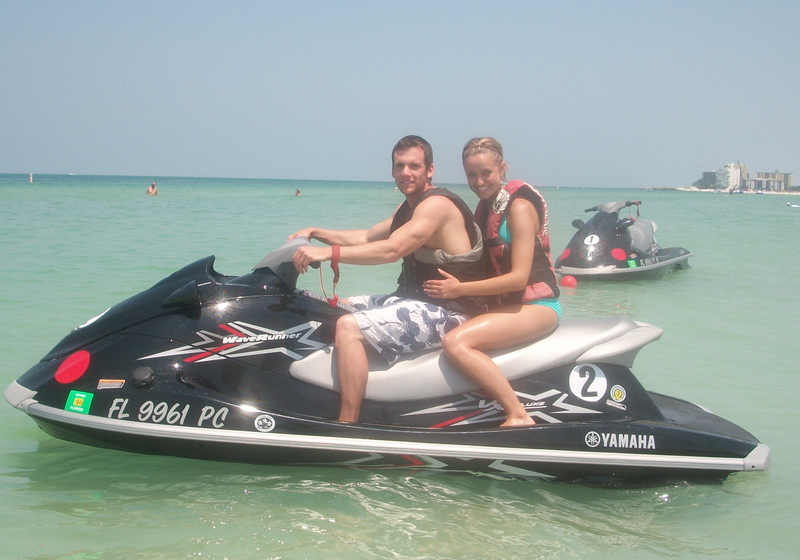 I gave in to jet skiing, and it was totally worth it. Our next long getaway took us to Las Vegas. 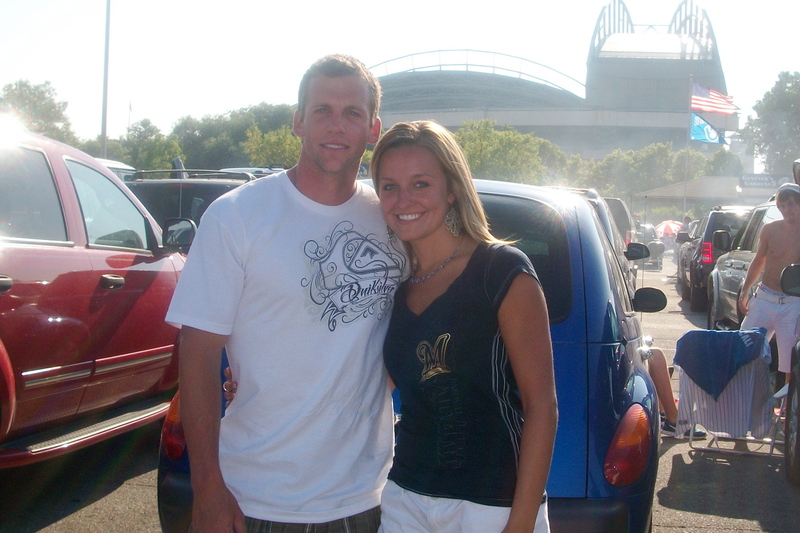 Although this was not the first time for Korey, it was my first time. In Vegas, Korey and I realized just how similar we really are, and it brought us that much closer. I have a feeling more sports will be in our future, and I’m 100% okay with that!!! 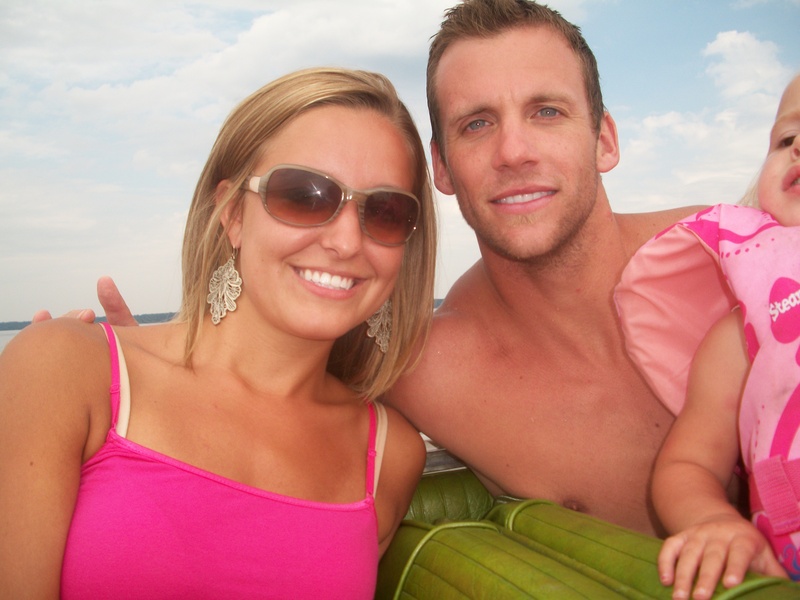 Korey and I knew from the first day we met that we both loved being outdoors in the sun, and by the water. It’s been great to be able to soak up the sun together. Everyone that knows Korey will tell you that he is hungry every few hours, and it just so happens that I follow a similar pattern. 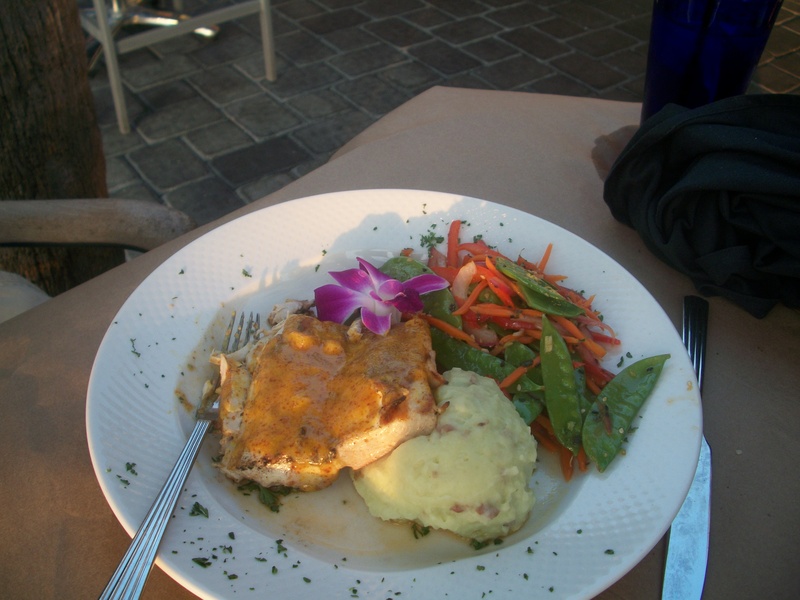 If it isn’t apparent from my blog, I am in love with food. Everyone that knows me, can attest to this… just another reason why we’re meant to be. 🙂 Along with our sports, traveling and sunshine, this past year has brought with it new foods and restaurants. Enjoying ice cream by the beach. We often have to set limits on the times we go out to eat together, but if it was up to us, we’d go out for every meal! However, we still find time to make meals at home. Despite the fact that my foods may look frightening at times, Korey has never hesitated to try, and I love him for that. Last but not least, this last year has been filled with a lot of love. From flowers, to sweet cards, romantic walks and sunset proposals, this year was definitely unforgettable. Usually Korey and I manage to go out to eat several times while he is home… it’s one of our favorite past times. 🙂 This week has been different though with my weird school schedule. Tonight we decided that we were due for a nice meal out together since we haven’t seen one another as often this week. Overall, it was tasty…and I was stuffed! 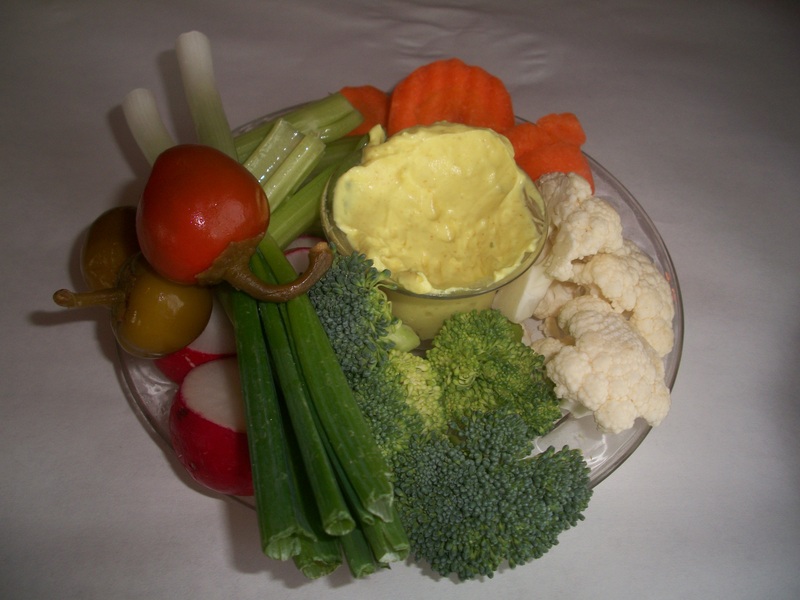 Dinner began with a veggie tray with a homemade dipping sauce. After munching on this for a while, they brought out our salads. 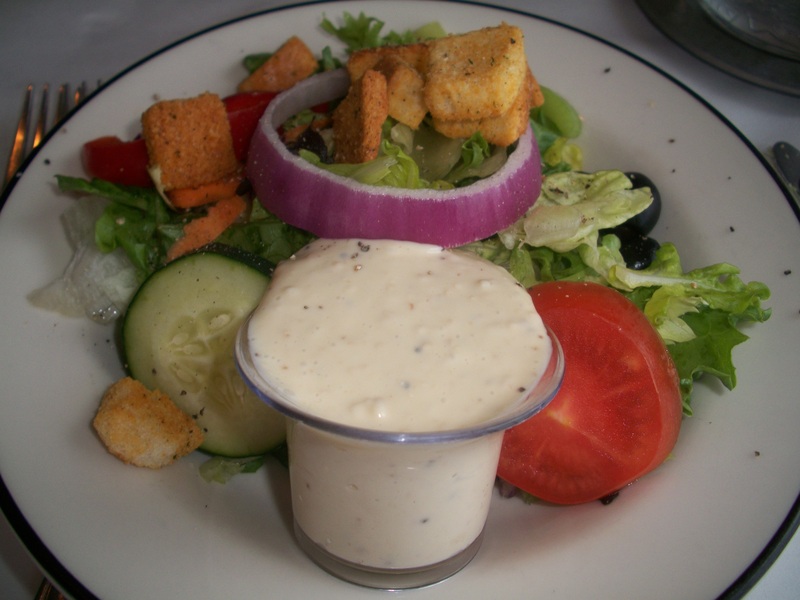 I ordered caesar dressing, and it was one of the best that I’ve ever had! Last but not least was the main course. 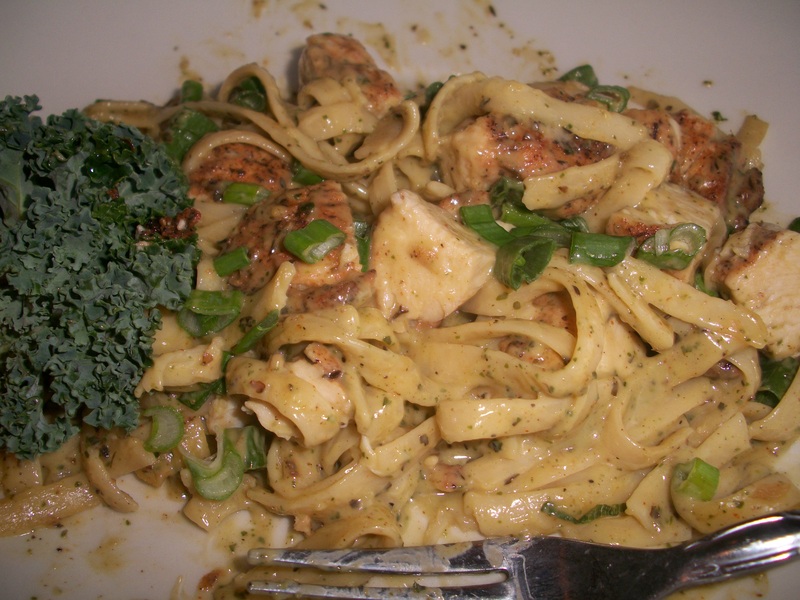 Korey ordered a 12 oz New York Strip, and I went with the blackened chicken pasta in a pesto cream sauce. I started eating before I remember to take a picture, so it doesn’t look too appetizing…but trust me… it was. Now we’re just relaxing together on the couch after a long day. Happy Monday…and a happy Monday is was… because my favorite person is in town, and that always makes me happy. 🙂 After getting ready and grabbing a quick nutrient-filled breakfast, I headed out the door to school. 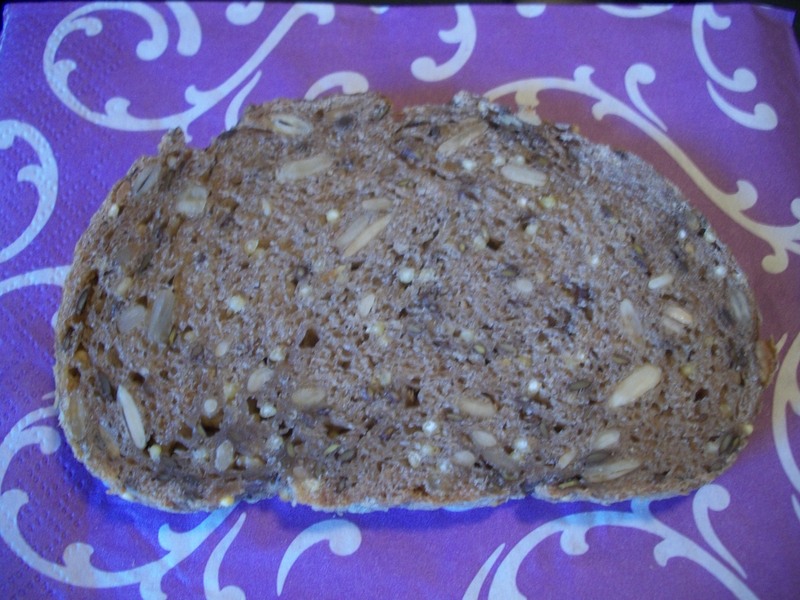 Sprouted grain bread-toasted with almond butter, banana slices and wheat germ on top. I was in a great mood today at school, and finally am starting to feel comfortable with the kids. 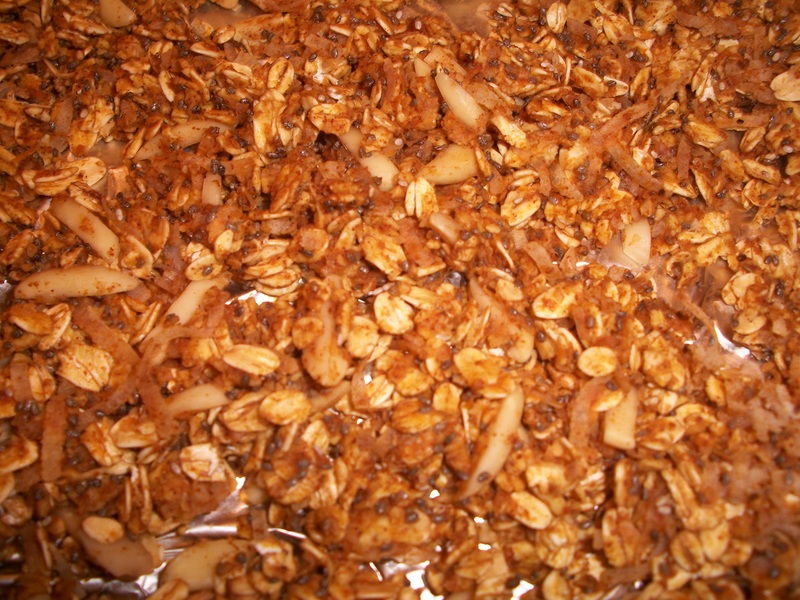 During our prep time, I snacked on a Chobani yogurt and added some of my homemade granola from last night. When lunch rolled around, I was ready! I’ve noticed that when I eat every 2-3 hours, my body starts to recognize this schedule and reminds me to eat every 2-3 hours. It really works out perfect for me because I love food and love to eat! Anybody that knows me would agree. 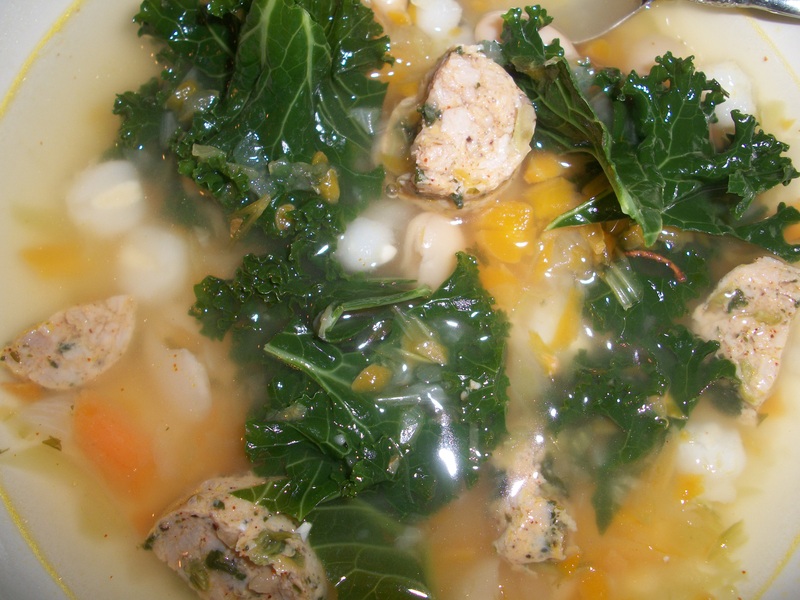 Lunch consisted of my homemade chicken kale soup from last night, and it tasted even more delicious today. The girls at lunch were ogling over it. Luckily after lunch, the rest of the day flew by, and before I knew it, it was was time to drive home and meet Korey. He got to my house within 10 minutes of me getting there, and we didn’t waste any time before heading out for a walk. Have you ever had one of those days where you want to eat everything in sight?? Well today, it was one of those days for me. 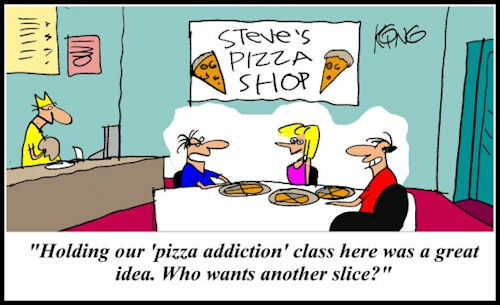 Between the kids making homemade pizza in class today and other students bringing in homemade treats, it was a rough day. The above cartoon is a perfect representation of my day. Typically I can turn my head and resist the temptation to give in to things I know aren’t good for me or aren’t necessary, but today my willpower was really lacking. I’m not sure why some days are better than others in the willpower department, but if anyone has any suggestions, I am in NEED!! After school, Korey and I met up with his parents and grabbed some ice cream. Again, when it came to willpower, I had none. I find myself feeling guilty whenever I have days like these… is anyone with me on this? ?